Rodgers & Hammerstein’s Oklahoma! begins the final week of performances today at Artisan Center Theater in Hurst, Texas. Claimed to be the highest grossing production in the theater’s history by an Artisan representative, the show has enjoyed sold-out crowds for most of its seven-week run. Laurey and Curly wave good-bye for the last time this Saturday evening, June 26, 2010. I will be performing the role of Curly McLain this Tuesday, Thursday and Saturday evening. Performances are subject to change so keep an eye on my event calendar for my up-to-the-minute schedule. However, both casts are wonderful so come out and see the show when you can! In fact, why not see it twice? Showtimes are Monday, Tuesday and Thursday through Saturday evenings at 7:30 PM with Saturday matinees at 3:00 PM. Click here for a map to the theater as Mapquest and Google Maps may mislead you. Tickets are available at the box-office or by calling (817) 284-1200. You may also buy tickets online at the Artisan Center Theater website – www.artisanct.com. 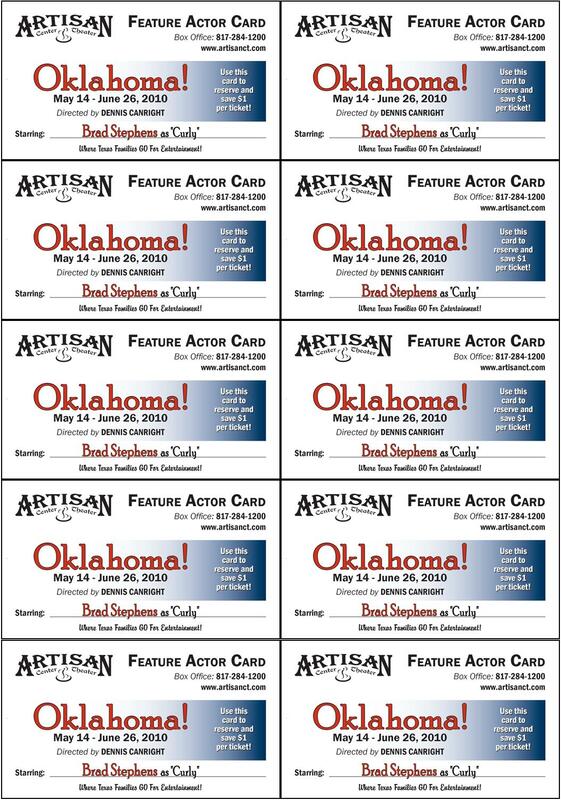 Coupons for discounts on tickets can be acquired by clicking the Feature Actor Card below. Print them out and distribute them to your friends!